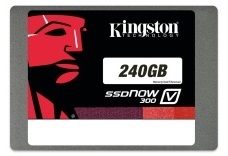 Kingston delivers the SSDNow V300, a new solid state disk with a customized SandForce SF-2281 controller. The disk is aimed at budget-minded users, it promises read and write speeds of up to 450MB/s, and random 4k write performance of up to 60,000 IOPS. The disk ships in capacities of 60GB, 120GB and 240GB, you can get it stand-alone or in upgrade kits for desktops or notebooks. Kingston Digital, Inc., the Flash memory affiliate of Kingston Technology Company, Inc., the independent world leader in memory products, today announced it is shipping the next generation of its most cost-effective SSDNow V Series solid-state drive. The Kingston® SSDNow V300 is a powerful upgrade solution for cost-conscious consumers looking to upgrade their existing desktop or notebook PC. The new SSDNow V300 is 10x faster than a 7200RPM hard-disk drive†. It is powered by an LSI® SandForce® Flash Storage Processor (FSP) solution customized for Kingston, and optimized for industry-leading 19nm NAND Flash memory to deliver sequential read and write speeds of up to 450MB/s. Using best-in-class components, SSDNow V300 combines quality, performance and affordability first-time SSD users or anyone looking to upgrade an existing system. "LSI worked together with Kingston to deliver a customized high-performing solid-state drive solution for their cost-effective SSDNow V Series," said Kent Smith, senior director of product marketing, Flash Components Division, LSI. "Our award-winning SF-2281 Client FSPs provide Kingston's customers with enterprise-class features and an enhanced everyday computing user experience, especially for first time SSD users." "Kingston is committed to delivering SSDs at the best price to performance ratio as possible. We achieve this again with our next-generation SSDNow V300," said Ariel Perez, SSD business manager, Kingston. "The SSDNow V300 is the best cost-efficient upgrade for users who want their existing systems to perform faster. They will experience faster boot up and shutdown times, and will also see much better system performance when multiple applications are open." The SSDNow V300 is available as a stand-alone drive or as an upgrade kit containing cloning software and other accessories for a desktop and/or notebook system. SSDNow V300 is backed by a three-year warranty, free technical support and legendary Kingston reliability. 1. Please note: Some of the listed capacity on a Flash storage device is used for formatting and other functions and thus is not available for data storage. As such, the actual available capacity for data storage is less than what is listed on the products. For more information, go to Kingston's Flash memory Guide. 2. Based on "out-of-box performance" with ATTO Disk Benchmark 2.41. Speed may vary due to host hardware, software, and usage. 3. Based on "out-of-box performance" with IOMeter. 4. Total Bytes Written (TBW) refers to how much total data can be written to an SSD for a given workload before the drive reaches its endurance limits.